And then we come to the enigma that is ManchesterCity. With the players they have they should be flying high at the top of the table, but it fills me with pleasure to say they are struggling (hey I am a Manchester United fan). At home they are phenomenal, a team full of goals and attacking ferocity they have destroyed most teams at the Etihad Stadium (beating Manchester Utd 4-1 and Norwich 7-0). But take them on the road and some of the results defy belief – loosing to Cardiff, Aston Villa and Sunderland – and if a team of City’s caliber are loosing to the likes of Villa and Sunderland then there is real cause for concern, and I haven’t even mentioned their ‘dodgy keeper’ Joe Hart. 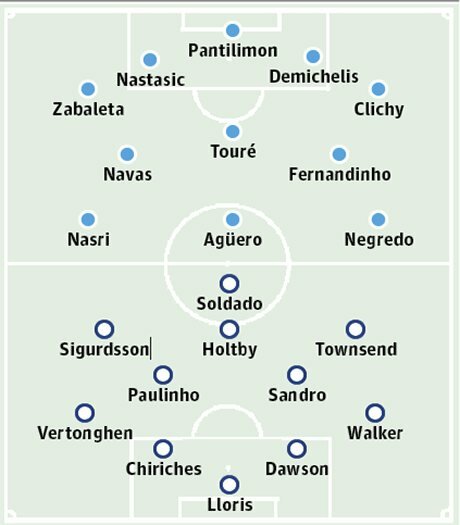 It is hard to predict who will win this game, given Manchester City are at home, I would say the points should be in the bag for Manuel Pellegrini’s team, but Tottenham may find a way to exploit City’s defensive frailties, and if that’s the case it should be an entertaining ninety minutes to watch.